For the image obtained, see Photograph. The word "photography" was created from the Greek roots φωτός (phōtos), genitive of φῶς (phōs), "light" and γραφή (graphé) "representation by means of lines" or "drawing", together meaning "drawing with light". The root of photo means "light" while graphos mean "drawing". Several people may have coined the same new term from these roots independently. Hercules Florence, a French painter and inventor living in Campinas, Brazil, used the French form of the word, photographie, in private notes which a Brazilian photography historian believes were written in 1834. Johann von Maedler, a Berlin astronomer, is credited in a 1932 German history of photography as having used it in an article published on 25 February 1839 in the German newspaper Vossische Zeitung. Both of these claims are now widely reported but apparently neither has ever been independently confirmed as beyond reasonable doubt. Credit has traditionally been given to Sir John Herschel both for coining the word and for introducing it to the public. His uses of it in private correspondence prior to 25 February 1839 and at his Royal Society lecture on the subject in London on 14 March 1839 have long been amply documented and accepted as settled facts. Photography is the result of combining several technical discoveries. Long before the first photographs were made, Chinese philosopher silver chloride. Techniques described in the Book of Optics are capable of producing primitive photographs using medieval materials. The discovery of the camera obscura that provides an image of a scene dates back to ancient China. 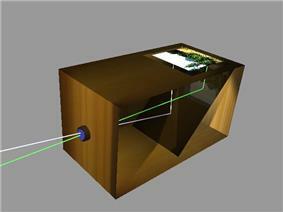 Leonardo da Vinci mentions natural cameras obscura that are formed by dark caves on the edge of a sunlit valley. A hole in the cave wall will act as a pinhole camera and project a laterally reversed, upside down image on a piece of paper. So the birth of photography was primarily concerned with inventing means to fix and retain the image produced by the camera obscura. Renaissance painters used the camera obscura which, in fact, gives the optical rendering in color that dominates Western Art. The camera obscura literally means "dark chamber" in Latin. It is a box with a hole in it which allows light to go through and create an image onto the piece of paper. 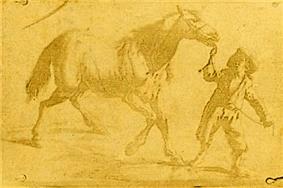 Earliest known surviving heliographic engraving, 1825, printed from a metal plate made by Joseph Nicéphore Niépce with his "heliographic process". The plate was exposed under an ordinary engraving and copied it by photographic means. This was a step towards the first permanent photograph from nature taken with a camera obscura, in 1826. Invented in the early decades of the 19th century, photography by means of the camera seemed able to capture more detail and information than traditional media, such as painting and sculpture. Photography as a usable process dates to the 1820s with the discovery of chemical photography. The first medium was photographic plate. The first permanent photoetching was an image produced in 1822 by the French inventor Nicéphore Niépce, but it was destroyed in a later attempt to make prints from it. Niépce was successful again in 1825. 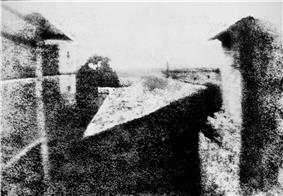 In 1826 or 1827, he made the View from the Window at Le Gras, the earliest surviving photograph from nature (i.e., of the image of a real-world scene, as formed in a camera obscura by a lens). Because Niépce's camera photographs required an extremely long exposure (at least eight hours and probably several days), he sought to greatly improve his bitumen process or replace it with one that was more practical. Working in partnership with Louis Daguerre, he discovered a somewhat more sensitive process that produced visually superior results, but it still required a few hours of exposure in the camera. Niépce died in 1833 and Daguerre then redirected the experiments toward the light-sensitive silver halides, which Niépce had abandoned many years earlier because of his inability to make the images he captured with them light-fast and permanent. Daguerre's efforts culminated in what would later be named the daguerreotype process, the essential elements of which were in place in 1837. The required exposure time was measured in minutes instead of hours. Daguerre took the earliest confirmed photograph of a person in 1838 while capturing a view of a Paris street: unlike the other pedestrian and horse-drawn traffic on the busy boulevard, which appears deserted, one man having his boots polished stood sufficiently still throughout the approximately ten-minute-long exposure to be visible. Eventually, France agreed to pay Daguerre a pension for his process in exchange for the right to present his invention to the world as the gift of France, which occurred on 19 August 1839. Meanwhile, in Brazil, Hercules Florence had already created his own process in 1832, naming it Photographie, and an English inventor, William Fox Talbot, had created another method of making a reasonably light-fast silver process image but had kept his work secret. After reading about Daguerre's invention in January 1839, Talbot published his method and set about improving on it. At first, like other pre-daguerreotype processes, Talbot's paper-based photography typically required hours-long exposures in the camera, but in 1840 he created the calotype process, with exposures comparable to the daguerreotype. In both its original and calotype forms, Talbot's process, unlike Daguerre's, created a translucent negative which could be used to print multiple positive copies, the basis of most chemical photography up to the present day. Daguerreotypes could only be replicated by rephotographing them with a camera. 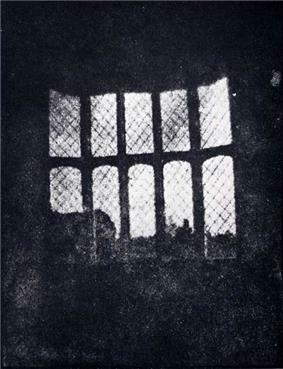 Talbot's famous tiny paper negative of the Oriel window in Lacock Abbey, one of a number of camera photographs he made in the summer of 1835, may be the oldest camera negative in existence. John Herschel made many contributions to the new field. He invented the cyanotype process, later familiar as the "blueprint". He was the first to use the terms "photography", "negative" and "positive". He had discovered in 1819 that sodium thiosulphate was a solvent of silver halides, and in 1839 he informed Talbot (and, indirectly, Daguerre) that it could be used to "fix" silver-halide-based photographs and make them completely light-fast. He made the first glass negative in late 1839. In the March 1851 issue of The Chemist, Frederick Scott Archer published his wet plate collodion process. It became the most widely used photographic medium until the gelatin dry plate, introduced in the 1870s, eventually replaced it. There are three subsets to the collodion process; the Ambrotype (a positive image on glass), the Ferrotype or Tintype (a positive image on metal) and the glass negative, which was used to make positive prints on albumen or salted paper. Many advances in photographic glass plates and printing were made during the rest of the 19th century. 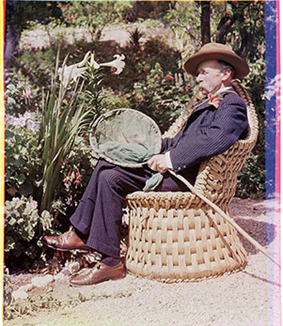 In 1891, Gabriel Lippmann introduced a process for making natural-color photographs based on the optical phenomenon of the interference of light waves. His scientifically elegant and important but ultimately impractical invention earned him the Nobel Prize for Physics in 1908. Photographic plates remained the only form of photography for entire 19th century until it was largely superseded by film photography in early 20th century. Plates though remained in use for some specific applications like long-exposure photography for a long time. The first flexible photographic roll film was marketed by nitrocellulose ("celluloid"), now usually called "nitrate film". Films remained dominant form of photography until early 21st century when advances in digital photography made them largely obsolete. Although 21st century is dominated by digital photography, film continues to be used by enthusiasts and format lovers. 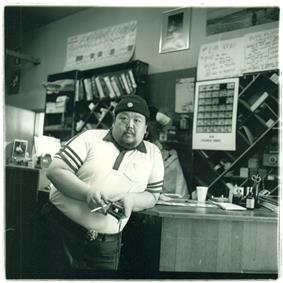 A camera store proprietor at Columbus Camera in San Francisco, California,1983. All photography was originally monochrome, or black-and-white. Even after color film was readily available, black-and-white photography continued to dominate for decades, due to its lower cost and its "classic" photographic look. The tones and contrast between light and dark areas define black-and-white photography. It is important to note that monochromatic pictures are not necessarily composed of pure blacks, whites, and intermediate shades of gray, but can involve shades of one particular hue depending on the process. The cyanotype process, for example, produces an image composed of blue tones. The albumen print process, first used more than 150 years ago, produces brownish tones. Many photographers continue to produce some monochrome images, sometimes because of the established archival permanence of well-processed silver-halide-based materials. Some full-color digital images are processed using a variety of techniques to create black-and-white results, and some manufacturers produce digital cameras that exclusively shoot monochrome. Monochrome printing or electronic display can be used to salvage certain photographs taken in color which are unsatisfactory in their original form; sometimes when presented as black-and-white or single-color-toned images they are found to be more effective. Although color photography is dominant, monochrome images are still produced mostly for artistic reasons. Almost all the digital cameras have an option to shoot in monochrome. Color photography was possible long before Kodachrome, as this 1903 portrait by Sarah Angelina Acland demonstrates, but in its earliest years the need for special equipment, long exposures and complicated printing processes made it extremely rare. The first permanent color photograph was taken in 1861 using the three-color-separation principle first published by physicist James Clerk Maxwell in 1855. Maxwell's idea was to take three separate black-and-white photographs through red, green and blue filters. This provides the photographer with the three basic channels required to recreate a color image. Transparent prints of the images could be projected through similar color filters and superimposed on the projection screen, an additive method of color reproduction. A color print on paper could be produced by superimposing carbon prints of the three images made in their complementary colors, a subtractive method of color reproduction pioneered by Louis Ducos du Hauron in the late 1860s. Kodachrome, the first modern "integral tripack" (or "monopack") color film, was introduced by Kodak in 1935. It captured the three color components in a multilayer emulsion. One layer was sensitized to record the red-dominated part of the spectrum, another layer recorded only the green part and a third recorded only the blue. Without special film processing, the result would simply be three superimposed black-and-white images, but complementary cyan, magenta, and yellow dye images were created in those layers by adding color couplers during a complex processing procedure. Agfa's similarly structured Agfacolor Neu was introduced in 1936. Unlike Kodachrome, the color couplers in Agfacolor Neu were incorporated into the emulsion layers during manufacture, which greatly simplified the processing. Currently available color films still employ a multilayer emulsion and the same principles, most closely resembling Agfa's product. After a transition period centered around 1995–2005, color film was relegated to a niche market by inexpensive multi-megapixel digital cameras. Film continues to be the preference of some photographers because of its distinctive "look". Digital camera, Canon Ixus class, c. 2000. The camera is the image-forming device, and photographic plate, photographic film or a silicon electronic image sensor is the sensing medium. The respective recording medium can be the plate or film itself, or a digital magnetic or electronic memory. The camera (or 'camera obscura') is a dark room or chamber from which, as far as possible, all light is excluded except the light that forms the image. The subject being photographed, however, must be illuminated. Cameras can range from small to very large, a whole room that is kept dark while the object to be photographed is in another room where it is properly illuminated. This was common for reproduction photography of flat copy when large film negatives were used (see Process camera). The movie camera is a type of photographic camera which takes a rapid sequence of photographs on recording medium. In contrast to a still camera, which captures a single snapshot at a time, the movie camera takes a series of images, each called a "frame". This is accomplished through an intermittent mechanism. The frames are later played back in a movie projector at a specific speed, called the "frame rate" (number of frames per second). While viewing, a person's eyes and brain merge the separate pictures together to create the illusion of motion. 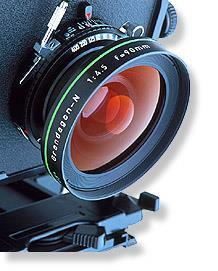 Aperture Adjustment of the lens opening, measured as f-number, which controls the amount of light passing through the lens. Aperture also has an effect on depth of field and diffraction – the higher the f-number, the smaller the opening, the less light, the greater the depth of field, and the more the diffraction blur. The focal length divided by the f-number gives the effective aperture diameter. Shutter speed Adjustment of the speed (often expressed either as fractions of seconds or as an angle, with mechanical shutters) of the shutter to control the amount of time during which the imaging medium is exposed to light for each exposure. Shutter speed may be used to control the amount of light striking the image plane; 'faster' shutter speeds (that is, those of shorter duration) decrease both the amount of light and the amount of image blurring from motion of the subject and/or camera. White balance On digital cameras, electronic compensation for the color temperature associated with a given set of lighting conditions, ensuring that white light is registered as such on the imaging chip and therefore that the colors in the frame will appear natural. On mechanical, film-based cameras, this function is served by the operator's choice of film stock or with color correction filters. In addition to using white balance to register natural coloration of the image, photographers may employ white balance to aesthetic end, for example white balancing to a blue object in order to obtain a warm color temperature. Metering Measurement of exposure so that highlights and shadows are exposed according to the photographer's wishes. Many modern cameras meter and set exposure automatically. 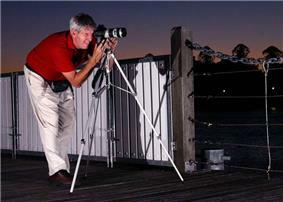 Before automatic exposure, correct exposure was accomplished with the use of a separate light metering device or by the photographer's knowledge and experience of gauging correct settings. To translate the amount of light into a usable aperture and shutter speed, the meter needs to adjust for the sensitivity of the film or sensor to light. This is done by setting the "film speed" or ISO sensitivity into the meter. ISO speed Traditionally used to "tell the camera" the film speed of the selected film on film cameras, ISO speeds are employed on modern digital cameras as an indication of the system's gain from light to numerical output and to control the automatic exposure system. The higher the ISO number the greater the film sensitivity to light, whereas with a lower ISO number, the film is less sensitive to light. A correct combination of ISO speed, aperture, and shutter speed leads to an image that is neither too dark nor too light, hence it is 'correctly exposed', indicated by a centered meter. Autofocus point On some cameras, the selection of a point in the imaging frame upon which the auto-focus system will attempt to focus. Many Single-lens reflex cameras (SLR) feature multiple auto-focus points in the viewfinder. Camera controls are interrelated. The total amount of light reaching the film plane (the 'exposure') changes with the duration of exposure, aperture of the lens, and on the effective focal length of the lens (which in variable focal length lenses, can force a change in aperture as the lens is zoomed). Changing any of these controls can alter the exposure. Many cameras may be set to adjust most or all of these controls automatically. This automatic functionality is useful for occasional photographers in many situations. The duration of an exposure is referred to as shutter speed, often even in cameras that do not have a physical shutter, and is typically measured in fractions of a second. It is quite possible to have exposures from one up to several seconds, usually for still-life subjects, and for night scenes exposure times can be several hours. 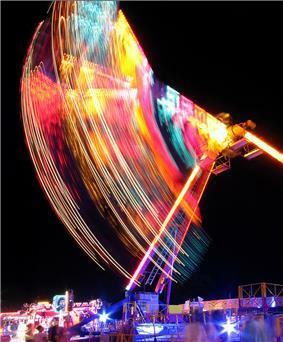 However, for a subject that is in motion use a fast shutter speed. This will prevent the photograph from coming out blurry. The effective aperture is expressed by an f-number or f-stop (derived from focal ratio), which is proportional to the ratio of the focal length to the diameter of the aperture. Longer lenses will pass less light even though the diameter of the aperture is the same due to the greater distance the light has to travel; shorter lenses (a shorter focal length) will be brighter with the same size of aperture. The smaller the f/number, the larger the effective aperture. The present system of f/numbers to give the effective aperture of a lens was standardized by an international convention. There were earlier, different series of numbers in older cameras. Image capture can be achieved through various combinations of shutter speed, aperture, and film or sensor speed. Different (but related) settings of aperture and shutter speed enable photographs to be taken under various conditions of film or sensor speed, lighting and motion of subjects and/or camera, and desired depth of field. A slower speed film will exhibit less "grain", and a slower speed setting on an electronic sensor will exhibit less "noise", while higher film and sensor speeds allow for a faster shutter speed, which reduces motion blur or allows the use of a smaller aperture to increase the depth of field. For example, f/8 at 8 ms (1/125 of a second) and f/5.6 at 4 ms (1/250 of a second) yield the same amount of light. The chosen combination has an impact on the final result. The aperture and focal length of the lens determine the depth of field, which refers to the range of distances from the lens that will be in focus. A longer lens or a wider aperture will result in "shallow" depth of field (i.e. only a small plane of the image will be in sharp focus). This is often useful for isolating subjects from backgrounds as in individual portraits or macro photography. Image capture is only part of the image forming process. Regardless of material, some process must be employed to render the latent image captured by the camera into a viewable image. With slide film, the developed film is just mounted for projection. Print film requires the developed film negative to be printed onto photographic paper or transparency. Prior to the advent of laser jet and inkjet printers, celluloid photographic negative images had to be mounted in an enlarger which projected the image onto a sheet of light-sensitive paper for a certain length of time (usually measured in seconds or fractions of a second). This sheet then was soaked in a chemical bath of developer (to bring out the image) followed immediately by a stop bath (to neutralize the progression of development and prevent the image from changing further once exposed to normal light). After this, the paper was hung until dry enough to safely handle. This post-production process allowed the photographer to further manipulate the final image beyond what had already been captured on the negative, adjusting the length of time the image was projected by the enlarger and the duration of both chemical baths to change the image's intensity, darkness, clarity, etc. This process is still employed by both amateur and professional photographers, but the advent of digital imagery means that the vast majority of modern photographic work is captured digitally and rendered via printing processes that are no longer dependent on chemical reactions to light. Such digital images may be uploaded to an image server (e.g., a photo-sharing web site), viewed on a television, or transferred to a computer or digital photo frame. Every type can then be produced as a hard copy on regular paper or photographic paper via a printer. Chemicals and process used during film development. Photographs, both monochrome and color, can be captured and displayed through two side-by-side images that emulate human stereoscopic vision. Stereoscopic photography was the first that captured figures in motion. 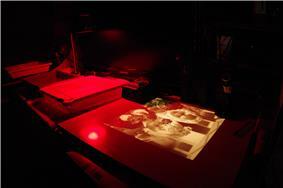 While known colloquially as "3-D" photography, the more accurate term is stereoscopy. Such cameras have long been realized by using film, and more recently in digital electronic methods (including cellphone cameras). An amateur photographer is one who practices photography as a hobby and not for profit. The quality of some amateur work is comparable to that of many professionals and may be highly specialized or eclectic in choice of subjects. Amateur photography is often pre-eminent in photographic subjects which have little prospect of commercial use or reward. Amateur photography grew during the late 19th century due to the popularization of the hand-held camera. Circus photography is a niche that involves taking action shots during a circus performance which requires the skill of high shutter speeds in low show light environments and capturing the split second of a trick is as vital as capturing the moment in sport photography. Landscape 360-degree panoramic picture of the Chajnantor plateau. In the center is Cerro Chajnantor itself. To the right, on the plateau, is the Atacama Pathfinder Experiment (APEX) telescope with Cerro Chascon behind it. There must be some one quality without which a work of art cannot exist; possessing which, in the least degree, no work is altogether worthless. What is this quality? What quality is shared by all objects that provoke our aesthetic emotions? What quality is common to Sta. Sophia and the windows at Chartres, Mexican sculpture, a Persian bowl, Chinese carpets, Giotto's frescoes at Padua, and the masterpieces of Poussin, Piero della Francesca, and Cezanne? Only one answer seems possible — significant form. In each, lines and colors combined in a particular way, certain forms and relations of forms, stir our aesthetic emotions. On 14 February 2006, Sotheby’s London sold the 2001 photograph 99 Cent II Diptychon for an unprecedented $3,346,456 to an anonymous bidder, making it the most expensive at the time. The camera has a long and distinguished history as a means of recording phenomena from the first use by Daguerre and Fox-Talbot, such as astronomical events (eclipses for example), small creatures and plants when the camera was attached to the eyepiece of microscopes (in photomicroscopy) and for macro photography of larger specimens. 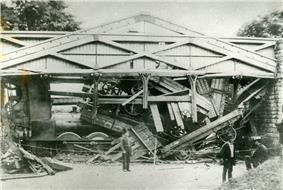 The camera also proved useful in recording crime scenes and the scenes of accidents, such as the Wootton bridge collapse in 1861. The methods used in analysing photographs for use in legal cases are collectively known as forensic photography. Crime scene photos are taken from three vantage point. The vantage points are overview, mid-range, and close up. By 1853, Charles Brooke had invented a technology for the automatic registration of instruments by photography. These instruments included barometers, thermometers, psychrometers, and magnetometers, which recorded their readings by means of an automated photographic process. Science uses image technology that has derived from the design of the Pin Hole camera. X-Ray machine are similar in design to Pin Hole cameras with high grade filters and laser radiation. Photography has become ubiquitous in recording events and data in science and engineering, and at crime scenes or accident scenes. The method has been much extended by using other wavelengths, such as infrared photography and ultraviolet photography, as well as spectroscopy. Those methods were first used in the Victorian era and improved much further since that time. Modern photography has raised a number of concerns on its impact on society. In Alfred Hitchcock's Rear Window (1954), the camera is presented as promoting voyeurism. 'Although the camera is an observation station, the act of photographing is more than passive observing'. Michal Powell's Peeping Tom (1960) portrays the camera as both sexual and sadistically violent technology that literally kills in this picture and at the same time captures images of the pain and anguish evident on the faces of the female victims. Digital imaging has raised ethical concerns because of the ease of manipulating digital photographs in post-processing. Many photojournalists have declared they will not crop their pictures, or are forbidden from combining elements of multiple photos to make "photomontages", passing them as "real" photographs. Today's technology has made image editing relatively simple for even the novice photographer. However, recent changes of in-camera processing allows digital fingerprinting of photos to detect tampering for purposes of forensic photography. Photography is both restricted as well as protected by the law in many jurisdictions. Protection of photographs is typically achieved through the granting of copyright or moral rights to the photographer. In the UK a recent law (Counter-Terrorism Act 2008) increases the power of the police to prevent people, even press photographers, from taking pictures in public places. ^ Spencer, D A (1973). The Focal Dictionary of Photographic Technologies. Focal Press. p. 454. ^ "Online Etymology Dictionary". Etymonline.com. Retrieved 24 June 2013. ^ Boris Kossoy (2004). Hercule Florence: El descubrimiento de la fotografía en Brasil. Instituto Nacional de Antropología e Historia. ^ Eder, J.M (1945) . History of Photography, 4th. edition [Geschichte der Photographie]. New York: Dover Publications, Inc. pp. 258–259. ^ a b Krebs, Robert E. (2004). Groundbreaking Scientific Experiments, Inventions, and Discoveries of the Middle Ages and the Renaissance. Greenwood Publishing Group. p. 20. ^ Wade, Nicholas J.; Finger, Stanley (2001). "The eye as an optical instrument: from camera obscura to Helmholtz's perspective". Perception 30 (10): 1157–77. ^ Davidson, Michael W; National High Magnetic Field Laboratory at The Florida State University (1 August 2003). "Molecular Expressions: Science, Optics and You – Timeline – Albertus Magnus". The Florida State University. Retrieved 28 November 2009. ^ a b "The First Photograph — Heliography". Retrieved 29 September 2009. from Helmut Gernsheim's article, "The 150th Anniversary of Photography," in History of Photography, Vol. I, No. 1, January 1977: ...In 1822, Niépce coated a glass plate... The sunlight passing through... This first permanent example... was destroyed... some years later. ^ Witt, Brown, Dunbar, Tirro, Witt (2005). The Humanities, Cultural Roots and Continuities, 7th Edition. Houghton Mifflin Company. Boston. New York. ^ Hirsch, Robert (2000). Seizing the light: a history of photography. McGraw-Hill. ^ Feldman, Anthony and Ford, Peter (1989) Scientists & inventors. Bloomsbury Books, p. 128, ISBN 1870630238. ^ "Black & White Photography." PSA Journal 77.12 (2011): 38–40. ^ Anderson, Joseph and Anderson, Barbara (Spring 1993). "The Myth of Persistence of Vision Revisited". Journal of Film and Video 45 (1): 3–12. ^ "Definition of focus". IAC. Retrieved 31 January 2012. ^ Belisle, Brooke (2013). "The Dimensional Image: Overlaps In Stereoscopic, Cinematic, And Digital Depth." Film Criticism 37/38 (3/1): 117–137. Academic Search Complete. Web. 3 October 2013. ^ Peterson, C. A. (2011). "Home Portraiture". 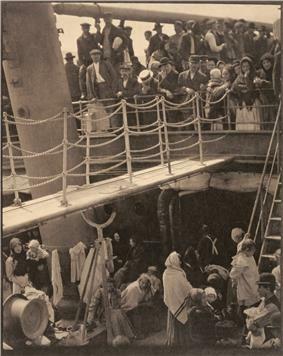 History of Photography 35 (4): 374. ^ "All Around Chajnantor — A 360-degree panorama". ESO Picture of the Week. Retrieved 13 April 2012. ^ Rohde, R. R. (2000). Crime Photography. PSA Journal, 66(3), 15. ^ "Photographic self-registering magnetic and meteorological apparatus: Invented by Mr. Brooke of Keppel-Street, London". The Illustrated Magazine of Art (New York: Alexander Montgomery) 1: 308–311. 1853. ^ Upadhyay, J.; Chakera, J. A.; Navathe, C. P.; Naik, P. A.; Joshi, A. S.; Gupta, P. D. (2006). "Development of single frame X-ray framing camera for pulsed plasma experiments". Sadhana 31 (5): 613. ^ Blitzer, Herbert L.; Stein-Ferguson, Karen and Huang, Jeffrey (2008). Understanding forensic digital imaging. Academic Press. pp. 8–9. ^ Bissell, K.L. (2000) Photography and Objectivity. ^ a b c d Sontag, S. (1977) On Photography, Penguin, London, pp. 3–24, ISBN 0312420099. ^ Levinson, P. (1997) The Soft Edge: a Natural History and Future of the Information Revolution, Routledge, London and New York, pp. 37–48, ISBN 0415157854. ^ Urry, John (2002). The tourist gaze (2nd ed.). SAGE. ^ Alex Gillespie. "Tourist Photography and the Reverse Gaze". ^ "Jail for photographing police? – British Journal of Photography". Bjp-online.com. 28 January 2009. Photography Changes Everything is a collection of original essays, stories and images—contributed by experts from a spectrum of professional worlds and members of the project’s online audience—that explore the many ways photography shapes our culture and our lives, by the Smithsonian Institution.